I could write 20 pages about our amazing trip to Vietnam but to spare you the time and effort, here is the abridged version! Firstly, what do I remember about our 16 day tour of Vietnam in 2009? 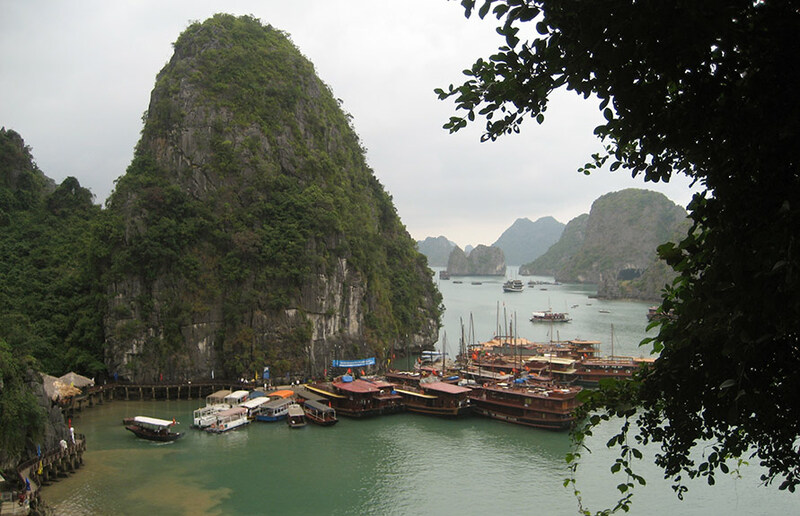 It has to be the incredible scenery, the fabulous wildlife, staying on a junk in stunning Halong Bay, the Fairy Stream, the towns and villages, and the people, all of which are unforgettable and to date, this has to be the most amazing holiday I have ever been on. Our 11 day escorted tour with The Travel Collection from north to south Vietnam included Hanoi, Halong Bay, Hoi An, Ho Chi Minh City and the Mekong Delta followed by a well-deserved 5 day stop at the Phan Thiet beach resort. The whole experience cannot be conveyed in so few words but the highlights below summarise our trip so that you can get an idea of what we saw. We were pleasantly surprised to be in a group of just two other people (a lovely couple from Scotland who made the trip even more enjoyable and very funny at times!) and we travelled by small minibus which was very good. Having booked the escorted tour, we had expected a large group in a large coach but this may be the case at times. This was the absolute highlight of the entire tour! A truly magical experience and the scenery was spectacular. Chu Chi tunnels – incredible and fascinating! Ho Chi Minh City at Night – We had a really lovely evening with the couple we were travelling with in Ho Chi Minh City. It was almost Christmas and the city was absolutely beautiful with Christmas lights all across the town. EVERYONE was in the city and the whole place was heaving with people, mopeds and toddlers dressed in Santa outfits. It took us ages to bravely cross the road and the only way to get from one side to another was to ‘just go for it’ and hope you made it without injury! We had some great cocktails in a bar with views of the city and then went for a lovely meal in one of the local restaurants before getting a taxi back to the hotel. The Fairy Stream at Phan Thiet – This was a bit hard to find but was an amazing and unique experience. We saw the most fabulous birds as we waded through the stream. Flip flops! Due to luggage allowances and thinking we could get some nice, cheap ones in Vietnam, we had not packed any men’s flip flops. Unfortunately we failed to consider that the average Vietnamese male is not over 6′ with size 11 feet! After hunting around for days we bought the largest size we could find which were far too small (around a size 9), didn’t last long and were a false economy. We finally found some large ones at the Chu Chi Tunnels which were made from old tyres so turned your feet black! So, the moral of the story is… make sure you pack flip flops unless you are small! Travel Durations – This was a fabulous tour that I would do again in an instant but there is a LOT of travelling involved! We spent many hours sitting in a mini bus but were lucky to be on holiday with a lovely, like-minded couple which really helped pass the time. The whole trip involved big planes, small planes, mini buses and various boats so be prepared. Please don’t let this put you off though, Vietnam is amazing and even if you are stuck in the bus, there is always something to see. Traffic – Be very careful when crossing the street, you have no right of way whatsoever and the cars or mopeds will not stop for you! Southern Vietnam is generally dry from November to April. May to October is warm, with heavy showers and the odd overcast day. Northern areas are cooler and drier from January to May and September to December. June to August can be hot, humid and showery.